Childhood immunizations protect against a wide variety of diseases, including diphtheria, measles, mumps, whooping cough (pertussis), polio, rubella, varicella (chicken pox) and smallpox. Yet, some parents reject these immunizations as unsafe, citing a fear of potential adverse health effects such as Sudden Infant Death Syndrome. Others express hope that their unvaccinated children will be protected from diseases as a result of the widespread immunity of their peers. The reality is that foregoing childhood immunizations is a dangerous practice that threatens the historic gains of modern disease control efforts. Whooping cough (pertussis) was one of the most common childhood diseases of the 20th century and a major cause of childhood death. CDC notes that whooping cough remains a major health problem among children in developing countries, with 195,000 deaths resulting from the disease in 2008 (World Health Organization estimate). 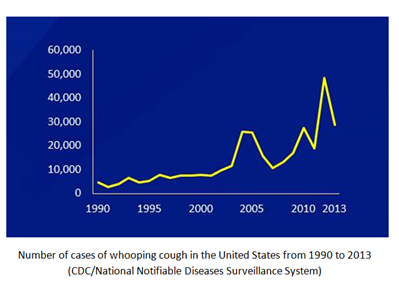 Annual cases of whooping cough in the United States numbered well over 200,000 in some years in the 1930s and early 1940s, before the widespread use of the pertussis vaccine in the mid-1940s. Subsequently, the annual number of cases of this disease declined to less than 2,000 by 1973 and remained low until 1992, which is roughly the time that concern for side effects arose and an increasing number of parents elected to not have their children vaccinated. Since then the annual number of cases has climbed 700% as illustrated by the CDC graph at right. Disease rates plummet when a critical proportion of the population is immunized. 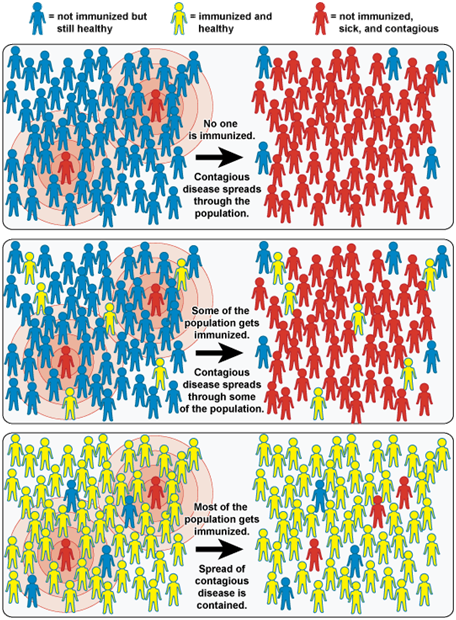 That is the principle of “community immunity” or “herd immunity.” The graphic below from the National Institute of Allergy and Infectious Diseases illustrates this concept. The spread of a contagious disease for which a vaccine exists can be stemmed only when a threshold level of the population is immunized. Ideally, the few individuals who are not immunized should be only those who are ineligible because of their health status. For everyone else, following the CDC recommended childhood immunization schedule is essential to avoiding the dire consequences of a resurgence of once-contained diseases. For more information on childhood immunizations, please see this document from the American Academy of Pediatrics. Thanksgiving Stress: What Rates High on Your Meter?